Hi guys! This week my digestive system was feeling a little off so i’ve been trying to keep my foods simple and full of things I know will make my body happy. So when my body begged me for pizza this week I had to figure out a way to eat it, obviously. I LOVE pizza. And I’m betting you do too. I finally found a healthy pizza I like and it’s made entirely of vegetables (minus an egg) so I easily eat the whole thing in one sitting. The best part? The crust is only 3 ingredients!! 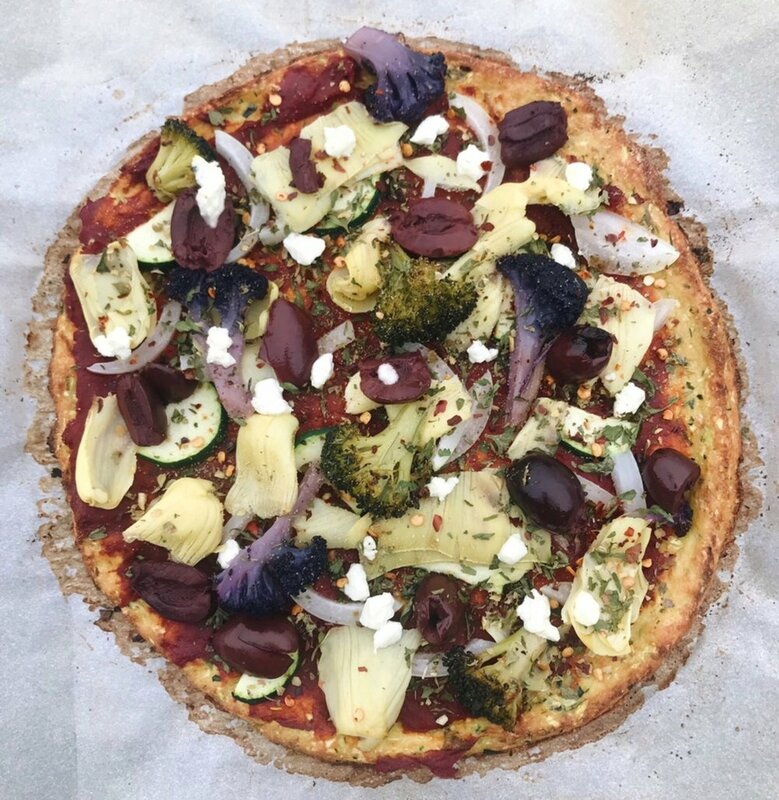 I looked for a cauliflower crust without cheese and couldn’t find one, so I created this one! It does take a while to bake so it’s not a recipe I make daily, but it’s so easy and so worth it. This was my first time making my own cauliflower rice from scratch. If you’ve never made your own cauliflower rice before it may look tricky but it’s actually pretty simple! Instructions on that below. I’m obviously biased to my toppings, and think they make an amazing veggie pizza, but the great thing about making your own is you can put anything you’d like on top! This crust is also paleo, vegetarian, and gluten free! First, prepare the cauliflower rice. To do so, blend one head of cauliflower (minus the stems) in a blender or food processor until it looks like snow. Add cauliflower rice and about 1 inch of water into a pot and cook on medium, covered, until the cauliflower is cooked. Drain excess water and let the cauliflower rice cool. Put the cauliflower on a dish towel and squeeze all of the excess water out. Keep squeezing water out until there isn’t any water dripping out. It should be sticking together now and look like a ball of dough. Combine cauliflower, zucchini, and 1 egg. Form into a circular shape about 1/4in thick on a parchment paper lined baking sheet. Remove from oven and add the sauce and toppings of your choice. I really hope you enjoy this recipe! If you do, you can be like me and eat pizza allllll the time! Get updates on what we're up to! My American Southwest Road Trip!